Underneath there is the names of the soon-to-be-married with a solid colored heart smack dab in the middle. These wedding can coolies can be printed in a wide variety of color options so that you can match your perfect day precisely! If you'd like to swap out the phrase "drink" with "beer", we've got a coolie for that! In case you aren't a fan of the heart between he names we also carry a coolie with less heart and an ampersand instead. 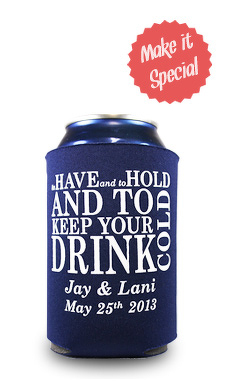 I ordered 200 koozie's for my wedding favors and they were very quick with making the ordeR, fast shipping. My favors turned out great! Very pleased with them!